With such a good response to the posting of articles from vintage QST magazines, I figured it would be worth investing in some copies of other electronics-related magazines. People old and young enjoy waxing nostalgic about and learning some of the history of, respectively, early electronics. Popular Electronics was published from October 1954 through April 1985. I remember reading the magazine back in my USAF days (1978-1982). A couple batches of Popular Electronics magazines came up for auction on eBay a week or so ago, and I managed to snag one set that included the December 1954 issues - Vol. 1, No. 3, the third edition. It also included some editions from early 1955. Then others stretched into the early 1960s. 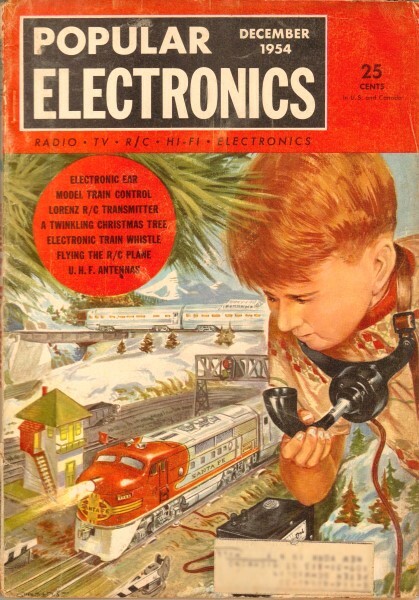 Popular Electronics was a hobbyist's magazine, and was chock full articles on small electronics projects, Ham radio, radio-controlled aircraft equipment, audio amplifiers, model train control, basic electronics lessons, and useful charts and tables of data. The editors jumped right on that newfangled transistor thing when it emerged as a commercial product! Here is the first installment. As with the QST and the vintage model aviation magazines I have posted from, the Popular Electronics articles have been scanned and OCRed in order to make all the text searchable (just posting a JPG of the page doesn't allow searching). Enjoy. Dodge officials are thanked by "walkie-talkie" for the truck they donated to Inter County Amateur Radio Club. 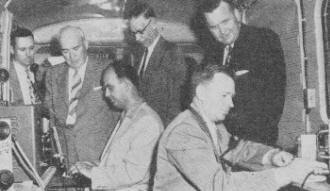 Left to right: William C. Newberg. president of the Dodge Div. ; Fred J. Lamborn, vice-president and general manager; L. J. Purdy. vice. 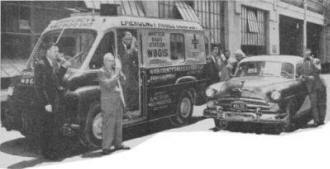 president and general manager-trucks; George Wilde, trustee of the radio club; Al Thomas, communications coordinator of the Detroit CD; Ted Hoffman, Detroit assistant executive director of the Red Cross; and John Sauer, coordinator for the ARRL of the mobile unit. A ceaseless vigil is being maintained by members of the Inter County Amateur Radio Club to provide valuable communications assistance in any disaster in the Detroit area. An emergency radio truck, donated by the Dodge Division of Chrysler Corporation, serves as a mobile unit for radio station W8GIS. The mobile unit is equipped with a generator and three complete radio stations, including a 2-meter teletype­writer. Many East Coast and Midwest stations have been contacted on the 10-meter band transmitter. Interior of mobile unit. Joe Gardella (left) operates 2-meter teletype while Gus Undy (right) vice-president of Multi-Products Co., donor of radio equipment. operates 10-meter transmitter. Looking on are John Sauer. Fred J. Lamborn. L. J. Purdy, and Wm. C. Newberg. The unit has room for five operators in the 1272 foot body. The 6', 4" headroom permits tall operators to stand erect. A heating unit keeps the truck comfortable in cold weather. The Club has built 104 "walkie-talkie" type units at a cost of about $25 each for use with the mobile unit and in other com­munications work. Members of the club are trained and ready to provide vital aid in any emergency or disaster in the Detroit area. They work closely with the Office of Civilian Defense and the American Red Cross in the area.